It was supposed to be a night of fun as Khloé Kardashian joined reported boyfriend French Montana at Penthouse nightclub in West Hollywood on Tuesday. But the festivities turned sour when the reality star learned her estranged husband, former NBA great Lamar Odom, was turned away at the door. According to TMZ, Lamar is still under contract with E! to appear on the reality series, and the network was conveniently present as the basketball star was turned away. Although, the gossip website spoke to a rep for the nightclub who claims Lamar's rejection had nothing to do with KUWTK. The Penthouse management was concerned Lamar might initiate a brawl with Montana, who was a featured guest at the club, and wanted to avoid an altercation at their establishment. The camera crews were reportedly there to film a segment with Khloe and French. Meanwhile, Khloe turned the evening into a family affair, bringing along her sister Kim. 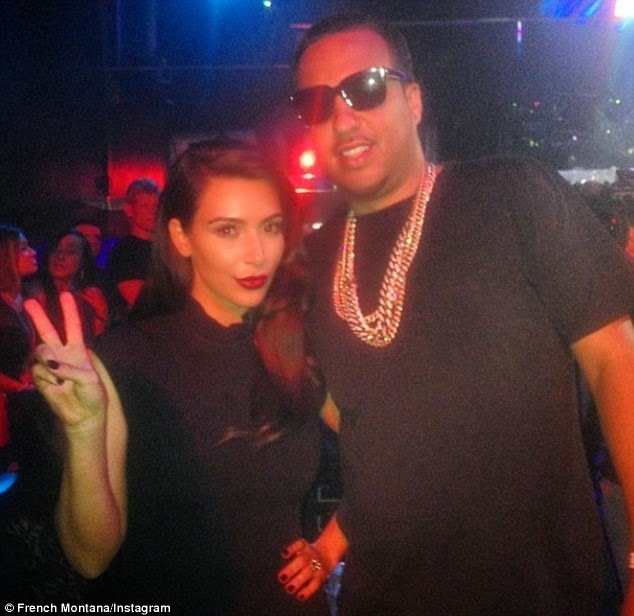 And French was eager to boast about his VIP companions, posting an image of him posing with Kim on Instagram. For the evening out with her new love and big sister, Khloe wore an all-black ensemble with a plunging neckline as her highlighted locks hung is flowing waves over her shoulders. French, with his new beau's ex right outside the venue, donned a series of gold chains over a simple T-shirt and gold flecked shorts, while wearing his sunglasses at night. Lamar, 34, stepped out for a night of planned clubbing in trainers, jeans and a cardigan as he sported a long chain with a medallion around his neck. Meanwhile, Khloé is reportedly beyond frustrated with estranged husband Lamar as he continues to drag his feet when it comes to signing divorce papers almost five months after she filed to dissolve their marriage. Despite the star making every effort to move on, happily flaunting her new relationship with Montana, RadarOnline reports that she's not fully able to enjoy her romance or immerse herself in it with the situation still hanging over her head. 'While Khloé is very happy with French - because he treats her like a queen - she isn't fully able to enjoy it because Lamar still hasn't submitted a response in their divorce proceedings,' a source tells the website. Letting her hair down in recent months after a stressful and draining time as her marriage crumbled last year, the reality TV star was apparently overheard saying 'how much fun she was having with French' as the two took in the Floyd Mayweather Jr versus Marcos Maidana boxing match in Sin City on May 3 before hitting up the Rehab pool party at the Hard Rock Hotel the following day. 'It has been ages since Khloé has been going to clubs and just having fun,' the source adds in approval. The statuesque blonde began divorce proceedings on December 13, calling time on her four-year union following allegations of infidelity and drug use on the professional athlete's part. Despite the whirlwind nature of their romance - marrying one month to the day after meeting - the couple reportedly had a prenuptial agreement in place, which should make the division of assets simple. But the NBA star may not be ready to let go just yet, as Radar reports that the basketball star has been 'blowing up' Khloé's phone with 'desperate calls' as he attempts to convince her that they should reunite, much to her annoyance. Though Lamar reportedly 'knows the marriage is over', he's said to be feeling jealous as his wife takes her new relationship public. While Lamar is yet to move on in the relationship department, he recently signed with the New York Knicks after being unceremoniously dumped by the Los Angeles Clippers last year amid reports of a dangerously out-of-control drug addiction. However, insiders fear that without his wife by his side to keep him on the straight and narrow, the move could be all but doomed.